Depending on your time horizon, age, investment sophistication, and investment objectives; an Indexed Annuity might be the right place to position your retirement dollars. Guarantees of principal protection, income options, and other benefits are made by an Insurance Company. You have to option to increase interest income by linking your contract to various indexes. We select only the highest rated companies. 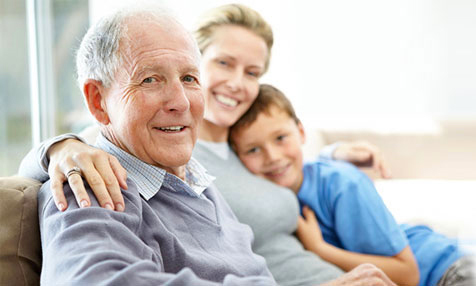 An annuity can be combined with long term care coverage. Call today to get all the details. It might be the most important call that you ever make. A saver is someone who does not and usually cannot accept risk. This can be because of age or upbringing. This could because of a lack of understanding about investing. This also can be just attributed to fixed pensions and standard of living. For the last 5 – 6 years the Fed has reduced interest rates to practically zero and also implemented QE1, 2,3. It was just this month that the Fed made an incremental raise in rates. During this period savers were offered extremely and unpalatable interest rates at the safe places, the banks. Savers were told to just tighten their belts, that there was no inflation to worry about. However these figure usually did not include food or energy costs. The savers had no option but place their funds in the stock market. The influx of capital was a prime reason for the increase in the stock market. After a time caution was thrown to the wind and the thought of risk or loss was neatly pushed aside. But what about now? In today’s world kids are geographically dispersed. When the problem arises about mom or dad what is to be done? The job of taking care of a parent usually falls on one child. This can create resentment and division in a family. I have a simple answer in practice. The kids can buy a long term care policy and split the costs among themselves monthly. In my own family my mother in law was aging. The children were all geographically dispersed and had their own children. The kids included included a lawyer, a psychiatrist, and only one child lived in the same town. I suggested that all 8 of us split the cost of a good policy. Don’t get me wrong. The kids are always at her side. The difference is that she has had competent and needed care in the best of places. She is today residing in an assisted living place and she is happy. Yes, Social Security has money problems. 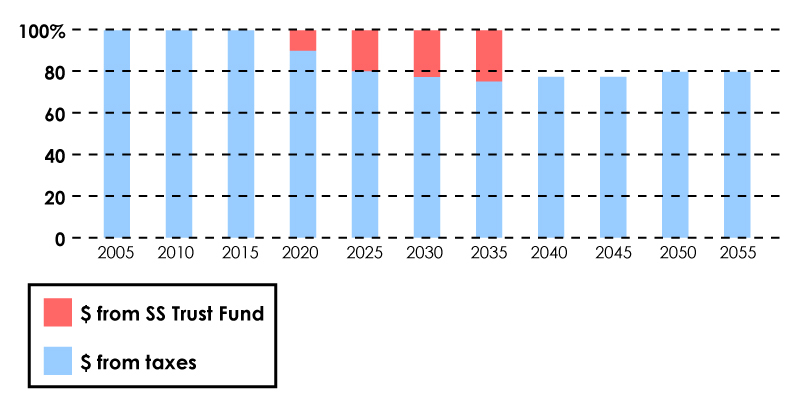 After benefit payments deplete the program’s Trust Fund, in about 2037, Social Security will only be able to pay about 78¢ on the dollar. Raise the Full Retirement Age – So those affected would need to claim later, and collect for a shorter period of time, to get the same monthly benefit. Freeze the purchasing power of monthly benefits at current levels – So if wages continue to rise, Social Security would replace a smaller share of the earnings of those affected. Cut the benefits of high earners – But protect the benefits of low earners. None of these proposals give you more if you claim early. If you are affected, you’ll get less no matter when you claim. *Nearly all proposals to fix Social Security would also protect those age 55 and older. Does not represent the Social Security Administration. Social Security – Should you bet that your life will be short? Monthly benefits are set so that lifetime benefits are much the same no matter when the average person starts to collect Social Security. – If you’re in poor health and unlikely to live as long as the average person, you’ll probably get less, over your lifetime, the later you claim. (That’s because you probably won’t get the highter monthly benefit long enough to make up for starting later). But note: many whose health is poor still outlive the “average person”. Should you bet that your life will be short? No one really knows how long they will live. But if you health is OK, you’ll probably outlive the average person. If you’re married and both in good health, the odds are even greater that you or your spouse outlives the average person. The cost could be quite high if you lose the bet and live “too long”. If blessed with long life, you might barely scrape by in your 80’s. You don’t have to claim when you retire. Retiring and claiming are two different things. So if you have enough savings when you retire, you have two options. – Start collecting right away. That’s what most people do. – Delay and, while you wait, use a portion of your savings to live on. This option will draw down your savings more quickly, but increase the inflation-proof Social Security benefit you’ll get each month for the rest of your life. Should you delay or claim right away? No one wants to draw down all their savings. Savings are valuable as a reserve, can be invested in high-yielding assets, or left as an inheritance. But drawing an income out of your savings, over an extended period of time in retirement, can be tricky. So it could make sense to use some of your assets to live on and delay claiming Social Security. – If you need to assure you and your spouse a higher basic income for the rest of you lives. – If you will still have enough savings for “rainy day” emergencies. However, Social Security is designed to replace your earnings when you no longer work. So if you start to collect benefits and continue work before you reach your Full Retirement Age, some of your benefits might be withheld. They’re rolled forward to increase your Social Security monthly benefits after you reach the Full Retirement Age. For example, say you start to collect benefits at 62, continue to work, and only retire for good at 63. If you earn so much that half your monthly benefits are withheld, at the Full Retirement Age your monthly benefit is raised to what it would be had you started to collect at 62 and a half. Special Rules that raise the benefits of the lower-earning spouse-most often the wife-generally make claiming later an attractive option for married men. If both husband and wife have claimed benefits, each is guaranteed half what the other would get at the Full Retirement Age (whih used to be 65, is now 66, and will be 67). Spousal benefits are reduced up to 35% if claimed before the recipient’s Full Retirement Age. Widow(er)s can keep their own benefit or, if they chose, instead claim a survivor benefit equal to their spouse’s monthly benefit. Survivor benefits are available as early as age 60, or age 50 if disabled, but are reduced up to 28.5% if claimed before the recipient’s Full Retirement Age. Survivor benefits almost always go to widows, as most survivors are women (wives are generally younger than their husbands and live longer) and most wives have lower monthly benefits (they generally ear less and start to collect at younger ages). Ex-spouses are entitled to these benefits if the marriage lasted 10 years. Most wives will outlive their husband, by about 7 years on average, and most widows get their husband’s higher monthly benefit in place of their own. A husband can increase the monthly benefit his wife gets as his survivor more than 20% if he claims Social Security at 66, no 62, and 60% if he claims at 70. *Claiming later could be the most effective way a husband can improve his wife’s long-term financial security. The later you claim, the more you get. The monthly benefit you earn as a worker is generally based on when you start to collect and the average of the highest 35 years of earnings on which you’ve paid Social Security payroll tax. 75% of original income is need to keep your standard of living. *As the Full Retirement Age rises to 67, benefits claimed at any age will replace a smaller share of earnings. …if working longer raises the average of the highest 35 years of earnings on which you’ve paid Social Security payroll tax. For example, say you were 62 in 2005 and had 31 years of employment, at $40,000 a year. Social Security is especially good for providing a basic retirement income that you and your spouse can rely on. The income it provides is inflation – proof and keeps coming as long as you or your spouse is alive. You get more dollars from Social Security if prices rise, so what you can buys stays the same. Employer pensions and private annuities provide a guaranteed income for the rest of your life. But they are rarely inflation-proof. If prices rise 3% a year, in 20 years they’ll buy barely half what they do today. 401(k)s, Individual Retirement Accounts (IRA)s, and other savings can be invested in stocks that could produce high returns, saved for rainy days, or passed on to your children. But high returns bring increased risk, and financial shocks are likely over the course of your retirement. On the other hand, cash in the bank is not inflation-proof. 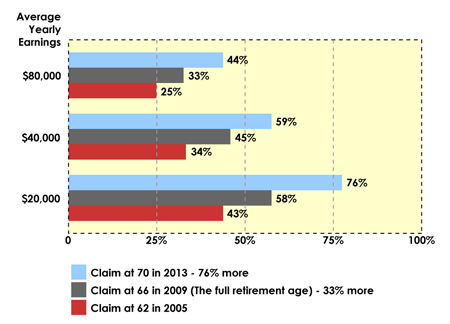 Work is an important source of income for some retirees. But few people work past 70. So relying too much on earnings could be a big mistake. *Social Security will likely be much more important as you age, as other sources of income often dry up.